کتابخانه | پژوهشهای ایرانی.دریای پارس. In my palm I have five tiny strands, like pieces of slightly fraying dark red sewing thread, which smell rather like a fruity tobacco. Four of them I’m placing into a cup and dousing with warm water; they’re destined for the cooking pot. The fifth I place on my tongue. I’m told this taste test is essential to check that what I’m using is proper saffron. After all, if you’ve spent more than £۵ for a gram of anything, you want to be sure it’s the real thing. And after a few seconds I’m gratified that, despite having languished at the back of my spice cupboard for quite some time, the tiny threads are still capable of imparting the heady floral aroma, the honey notes, and the slight astringency I’ve been promised. And the strands in the water are leaching an orangey hue, as they should. Saffron is central to national cuisines from Morocco to the Himalayas, essential to dishes from risotto Milanese to Kashmiri curry. As well as being a sought-after culinary ingredient the versatile spice is also increasingly being added to medications and cosmetics. Cleopatra used it to infuse her bathwater. Alexander the Great bathed his battle wounds with it and drank saffron tea. It is added to products from coffee to salt, skin creams to shampoos. And yet the reputation of the spice, dubbed “red gold”, still does not glister quite as brightly as perhaps it should. Keith Alaniz, an American soldier-turned-entrepreneur, thinks he understands why. After serving in Afghanistan, he and two other veterans decided to establish a social enterprise based on a crop that could offer locals better returns than illegal opium poppy cultivation. Their company, Rumi Spice, buys saffron crocuses from local growers and employs 380 Afghan women to do the painstaking work of separating the tiny rust-red stigmas in the centre of the crocus from its petals, stamens and the rest of the flower head, prior to being dried and packed for export. It’s those long laborious hours of work that makes saffron so expensive. Rumi Spice sells its saffron – higher grade than the one from my kitchen cupboard – for $18 (£۱۴) per gram. Mr Alaniz says saffron’s high price tag is the reason it has so much promise in war torn Afghanistan. But it is also in many ways the root of its biggest problem: it makes it extremely tempting for counterfeiters. He says they’re battling against the disappointment some shoppers have felt in the past. They’ve spent money on an extravagant product, only to find it didn’t have much flavour because it was substandard or even fake saffron. Their saffron is now doing well with specialist buyers and high end restaurants. And they hope to rebuild its reputation amongst ordinary consumers in the same way. But the plan will only work if the product consistently delivers on its promise; and despite recent efforts to introduce more rigorous standards, stories continue to circulate of horse hairs, corn silks, and shredded paper, all masquerading as saffron. Earlier this year there were reports of the synthetic food colourings tartrazine and sunset yellow being used in counterfeit powdered saffron. Sally Francis, botanist and saffron grower, says only a few weeks ago she saw safflower, a common substitute from the unrelated thistle family, being sold as saffron in a street market in the Netherlands. And she’s met plenty of tourists returning from exotic holidays with what they thought was bargain saffron, only to find out it was bogus. Even legitimate saffron can vary enormously depending on how it’s produced, she says. “You can have a huge range in saffron quality, with no indication on the packaging as to what you are buying,” says Ms Francis. Often it’s simply that careless harvesting has meant some of the flavourless parts of the crocus have found their way into the final mix. It’s still saffron but rather than “packing a punch” like the purest spice, what you’re basically getting is “expensive yellow food colouring,” she says. “The difference between a grade I and a grade III that’s huge. You’re talking Trabant and Lamborghini,” she says. Ms Francis produces saffron on a small scale in Norfolk. The UK is a tiny player in the global saffron market, despite a saffron tradition going back several centuries. 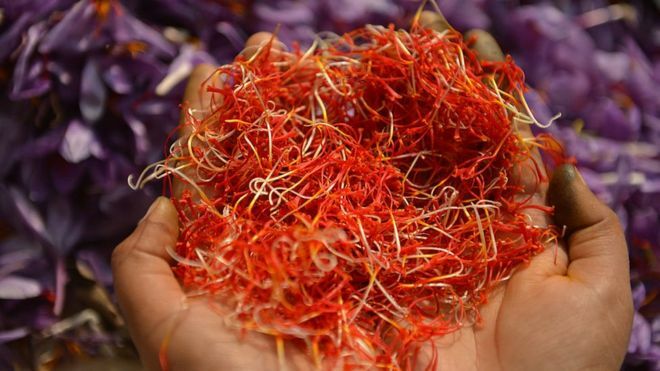 But it is one of many countries from New Zealand to Germany, Greece to India, where producers are recognising the potential for high-grade saffron, with transparent country of origin and quality labelling, to reassure consumers that it is worth the high price tag. In Iran which supplies around 90% of the world’s saffron, there are signs that traceability and certification are becoming priorities. “We are trying to show the quality of Iranian saffron to other people in the world,” says Mehrdad Rowhani, chief executive of a family-owned wholesaler from Mashhad, the city at the heart of Iran’s saffron growing region. After years hampered by American sanctions, which meant a lot of Iranian saffron ended up exported in bulk to be repackaged and sold as “produce of Spain” or sold via backdoor bartering deals, Iranian producers are again able to sell directly to western customers. This could have more impact than anything else on the standard of saffron available to ordinary shoppers, as Iran’s producers embrace the opportunity to emphasise the authenticity, origin and quality of their product. Mr Rowhani says his firm’s exports have already more than doubled since sanctions were lifted. “We started exporting to the United States and we have good – and big – customers from there,” he says. Now he’s focusing on improving every step of the production process from planting, harvesting and drying, to selling in smaller, better designed packaging. 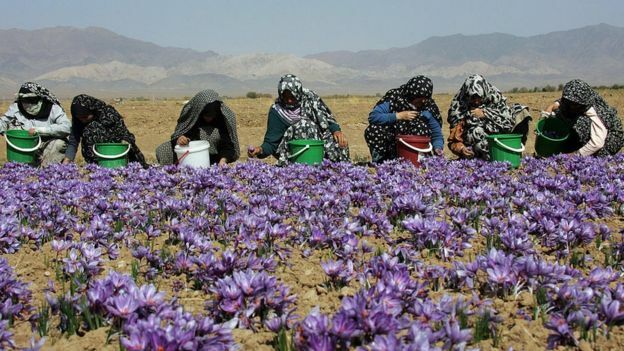 “When they see Persian saffron is of high quality, they want to buy more,” he adds. .کتابخانه ديجيتال جهان افتتاح شد. علاقمندان از سراسر جهان مي توانند به منابع الکترونيکي اين کتابخانه از طريق وب سايت آن دسترسي داشته باشند. اين وب‌ سايت در اداره ي مركزي يونسكو در پاريس كار خود را آغاز کرد. در اين وب ‌سايت كتاب ‌هاي نادر، نقشه‌ هاي تاريخي، نسخ خطي، ‌فيلم و عكس از كتابخانه ‌ها و آرشيوهاي سراسر جهان ارائه مي ‌شود. مراجعه كنندگان به اين سايت قادر خواهند بود تا به تمام اين موارد به هفت زبان عربي، چيني، انگليسي، فرانسوي، پرتغالي، روسي و اسپانيائي دسترسي يابند. 32 موسسه از برزيل، بريتانيا، چين، مصر، فرانسه، ژاپن، روسيه، عربستان سعودي، و آمريكا براي اجراي اين پروژه به ياري سازمان يونسكو شتافتند. شرکت گوگل و بنياد قطر هر کدام با سه ميليون دلار، بنياد کارنگي با دو مليون دلار، دانشگاه علم و تکنولوژي ملک عبدالله با يک ميليون دلار و شرکت مایکروسافت با يک ميليون دلار کمک،‌ از جمله پشتيبانان مالي اين طرح هستند. کتابخانه ديجيتال جهان جلوه‌هاي فرهنگي نقاط گوناگون جهان را به صورت چندزبانه و رايگان در اختيار کاربران قرار مي‌دهد . Divan-i Mawlavī Rumi (Anthology of Rumi’s poetry) is a collection by the great Persian poet, Jalāl ad-Dīn Muḥammad Rūmī, popularly known in Persian as Mawlānā and in English as Rumi (1207–73). The collection includes poems on Sufism, supplications, and philosophy. The manuscript does not have a title page. Every poem is individual and self-contained, and the name of the poet appears at the end of most of the poems. Nothing is known of the copyist, although it is thought that this volume is 19th century. Tārīkh-i A‘ẓami: Vāqi‘at Kashmīri (The great history of the events of Kashmir) is a history of Kashmir, India, from the 12th century to the 18th century, written in 1747 by the saint, scholar, and poet of Kashmir, Mohammad A‘zam Diddimrī Kashmirī (flourished 18th century). The work is considered to be one of the important authentic sources for the medieval history of Kashmir. This volume is a 19th-century copy from an unknown hand. Ayām-i Ghadr (The days of mutiny) is a historical account of events related to the Indian Mutiny of 1857, an uprising of native soldiers (sepoys) against the army of the British East India Company, which marked an important step in India’s struggle for independence and freedom from British rule. The manuscript is a rare unpublished source on Indian history, and particularly on the Mutiny of 1857. It contains two paintings, at page 108 and page 175, which depict events described in the text. Maghāzī al-Nabī (The life of the Prophet) depicts the life of the Prophet Muhammad in poetical form. The original work was composed by a famous Arabic and Persian scholar of Kashmir, Ya‘qub Ṣarfī (1521–95). The unique poetic and biographical work, transcribed in two columns on each page of manuscript, includes some supplications and eulogies for the Prophet of Islam. Each column is bordered in lines inlaid with gold. The writing of the manuscript is clear and vivid. Risalat-i‘Urūḍ va Qafiyah (Treatise on the rules and meters of poetry) is about rules and conventions to be followed in writing good poetry. The manuscript, copied in Kashmir, India, in 1677 (1088 AH) from a work by an unknown author, discusses different aspects of the writing of poetry and elucidates the different elements and considerations used in creating good poetry. South Asia 2060: Envisioning Regional Futures is a comprehensive volume of essays edited by Adil Najam and Moeed Yusuf. Given the importance of the South Asian region, this book attempts to fill in a huge gap that has existed for decades. Discourses on South Asia for reasons well known, have been obsessive about all things security and in recent times terrorism. The editors note that South Asia “sits atop a globally strategic location” and gladly move on to other important topics, which makes this volume a useful contemporary reference. The introduction notes the immense potential for energy trade as well as the significant regional security implications for the world at large. This is why the future of South Asia is not just important to those who live in the region; it is duly a global concern. The 37 papers authored by 44 experts, in the volume trace the multiple futures and mercifully avoid the common fallacy of reducing South Asia to India and Pakistan and their bitter rivalries. The introduction summing up the book rightly identifies that the idea of South Asia is a contested one and its ownership – political and economic – would determine the future. Commenting on the term Southasia introduced by Nepal based Himal magazine, the editors state: “…the future of the geography we know as South Asia will depend, at least in part, on what happens to the idea of Southasia. We are not in a position to say what that will be just yet, but it is clear that the aspiration of Southasianness is entrenched more deeply in the South Asian mind than we had imagined. It is an idea that our regional politics has often rejected and fought against. But the resilience of the aspiration suggests regional politics may eventually have to embrace it.” Thus the emergence of Southasia, a regionalized identity, will be a political process and the book suggests that there is no one course or prediction to hold it. In this context the paper, the paper by US based Pakistani historian Manan Ahmad Asif entitled “Future’s Past” contends that though the immediate history of Pakistan and India might broadly be cause for pessimism (such as the violent partitions of ’47 and ’71), there is nevertheless a greater, storied and shared history that can be recalled in order to realize how communities in South Asia can peacefully co-exist. The editors of the volume identify the following common themes around which the book is organised: ‘Idea of South Asia’, ‘Regionalism’, ‘The South Asian State’, ‘Security and Development’ and ‘South Asia and Its People’. The essays highlight how South Asia is a more of a competitive region than a cooperative one. The troubled experience of South Asian Association for Regional Cooperation (SAARC) and other attempts at regionalism testifies to this reality. Smaller states with much to gain from regionalism are themselves exasperated with Pakistan and India – the primary reason behind the regions failure to integrate. As pessimism reigns however, there are murmurs of optimism as Pakistan and India seek to open trade, perhaps leading to the reinvigoration of SAARC. The theme pertaining to South Asian State is an insightful part of this volume as it traces the trajectory of the postcolonial states and how they have failed to maintain the social contract leading to a less charitable view of the future in many quarters. At the same time, the essays also highlight the immense potential for ‘constant metamorphosis’ of the state idea and are open to change with sufficient external and internal impetus. A pertinent observation extracted by the editors relates to the possibility of an inclusive, regionalized state. In a similar fashion the papers tell us that a region confronted with multitude of conflicts trumpets human development. The editors and some of the essays emphasise ‘co-dependence’ of security and development and an outcome which would be more people-centric rather than the current state or military oriented security discourse common in South Asia. Safiya Aftab mentions the importance of entwining poverty reduction with economic growth, arguing that even if South Asia’s rate of development hovers around an acceptable 8%, that in itself will not lead to a reduction in poverty – or at least not a considerable enough reduction. She posits that there needs to be a “serious realignment of government policy towards income redistribution and investment in human development”, and that in the face of a lack of regional integration, growth on itself will not solve the region’s significant issue of poverty. A focus solely on economic growth without factoring in human development and wealth redistribution will only lead to greater disparity in wealth and prosperity, which in turn can lead to social unrest. South Asian states need to revisit their dependence on neo-liberal prescriptions and read Aftab’s essay carefully. In fact, the key factor influencing the future of the region relates to the future trajectories of economic cooperation. Another well-researched essay in the volume, ‘Trade Relations: Some Predictions and Lessons by Pradeep S. Mehta and Niru Yadav tells us the gritty realities. The authors state how in 2011 “the total trade of South Asian countries amounted to $928.17 billion, with only $28.23 billion exchanging hands through regional trade.” Only less than 4% of South Asia’s trade was interregional making it the least regionalized areas of the world. Despite the numerous free trade agreements, political mistrust and a lack of political will have led to states pursuing their own bilateral FTAs, thereby circumventing the choked provisions of regional agreements such as SAFTA. The key theme of volume – South Asia and its people – highlights how the countries in the region need to shift from a state centric position to people-oriented polities. There is now an emerging consensus that the people of South Asia are dynamic cultural, economic and political agents. With advances in technology, a burgeoning young population and democratic consolidation the power of South Asians to drive ‘change’ and demand rights is likely to increase. Regional cooperation initiatives such as Aman ki Asha and other movements are showing the path. Graffiti is plural for graffito and is defined in the Concise Oxford Dictionary as “a piece of writing or drawing, scribbled, scratched or sprayed on a surface”. This piece is about all the three kinds of graffiti as seen on the walls of Delhi. There are other kinds of graffiti that use visuals or language that one prefers to avoid and we will not talk about those for that may lead to the raising the collective moral heckles of those whose sentiments are easily hurt. We will begin with writing, go on to the scratched and conclude with the painted and sprayed kinds of graffiti. The first, and to my mind one of the finest examples of the traditional art of graffiti, can be found in an unnamed mausoleum inside the Mehrauli Archaeological Park. To reach this graffiti you will have to enter the Mehrauli Archaeological Park from the GandhakkiBaoli side. After crossing an ancient and now encroached upon mosque and a few houses to your left, you will be in front of a large square structure surmounted by a dome. The ruin dates back to the Sultanate period. Enter the structure and you will notice that the central arch (Mehrab) on the western side is blocked; this is to indicate the direction of Mecca for visitors, who might want to pray for the soul of the departed. On one of my visits I saw some Persian poetry written on this central Mehrab, the person who wrote it had obviously come prepared. He had a fine hand; he could have been a trained calligrapher. Part of the first line, written in bold strokes with a reed pen and in Indian ink, was still legible as was part of the second line, written in smaller and less well formed strokes. I copied the words that I could read and took them to the Persian scholar Dr. Akhlaq Ahmad Aahan who teaches at Jawaharlal Nehru University. I showed him the words and he said this is most likely the poetry of Sheikh Hafiz Sheerazi. This is subversive Sufi poetry at its best and the graffiti artist knew what he was doing, to write this couplet from one of the greatest poets of Persian and to write it on the arch, that functioned as the qibla, is so well founded in the tradition of graffiti that one begins to wonder if graffiti too, like so many other great things have its origin in the east. The example of the scratched graffiti that we present here is taken from the mosque and baoli popularly known as RajonkiBaoli from the Mehrauli Archaeological Park. The structures commissioned in 1516 by Daulat Khan, a noble in the court of Sikander Lodi, came to be called RajonkiBaoli because a group of masons (Raj-Mistris) had begun to live inside the mosque in the early 20 century. The graffito is taken from Daulat Khan’s mosque and will come in the category of ‘Scratching’. The text is written in a bad hand and the content “JitenderJyoti Romeo” has no meaning except the obvious. From Hafiz Sheerazi to Romeo, from the sublime to the ridiculous. The third example of graffiti that we bring for you, from near Shivalik, near Malviya Nagar, in South Delhi is the latest addition to street art in Delhi and is something that needs to be encouraged. This is modern graffiti and our civic authorities will do a lot of good to the city to allot the drab and colourless government walls to these artists and let them paint without fear of being hauled up under the “Bengal Act” on defacement of public property. Right now these creative young people are forced to work surreptitiously like guerrilla squads using names like Daku, Rane, Zeb Star, Rush and Treble. We also need to develop a policy that helps us protect the first kind of graffiti because this graffiti is now part of history; to prevent the vandalism of the second variety; and to encourage the third kind and hope that Delhi will soon become the ‘Centre of Graffiti’.